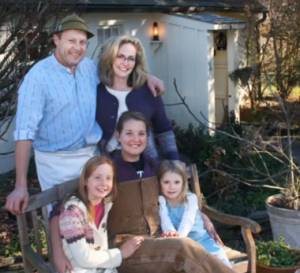 Tom and Barbara Schaer pose with their two daughters (front row) and only employee at Meadowset Farm in Landenberg. Local farmers who implement best management practices and demonstrate community involvement will be lauded next month by the Chester County Agricultural Development Council. Chester County’s 2013 Farmers of the Year awards will be given to Pete Flynn of Pete’s Produce Farm in Westtown and Tom and Barbara Schaer of Meadowset Farm and Aviary in Landenberg. The presentations will occur during a celebration of National Agriculture Day by AgConnect, a regional network of farmers, business owners, and service providers, a Chester County Economic Development Council news release said. Flynn, who works closely with the Chester County Food Bank, grows a large variety of produce on his farm and sells the products at his store on Rt. 926 in Westtown. Tom and Barbara Schaer are practicing veterinarians at New Bolton Center; they raise sheep to produce raw sheep’s milk cheeses at Meadowset Farm, the release said. 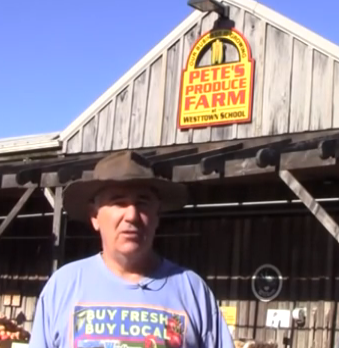 Pete Flynn of Pete’s Produce will be honored on March 25. The dinner will take place on March 25 from 5 to 9 p.m. at Franklin Commons, 400 Franklin Ave., Phoenixville. Russell Redding, dean of agriculture and environmental science at Delaware Valley College, will be the guest speaker. He is a former secretary of agriculture for Pennsylvania. The evening will include an appetizer cook-off hosted by Chef Peter Gilmore and students from the culinary program at Delaware County Community College. Gilmore spent 22 years at Le Bec-Fin restaurant in Philadelphia, and then 11 years at Gilmore’s, his own restaurant in West Chester. He is now the culinary arts program manager at the college’s Downingtown campus. Three teams of Gilmore’s students, using local ingredients, will compete for the “best appetizer” award as selected by dinner guests. A silent auction will be held to raise contributions to support AgConnect’s agricultural training programs. Tickets range from $75 for farmers to $99 for supporters and are available at www.nationalagday.eventbrite.com. AgConnect works to connect farmers to business resources, training, and financing to grow business and promote smart economic development. A regional private-public partnership, AgConnect serves Berks, Bucks, Chester, Delaware, Montgomery, and Philadelphia Counties. Sponsors for the event include MidAtlantic Farm Credit, Golden Valley Farms, Artisan Exchange American Mushroom Institute, and Country Fresh Mushrooms. The Chester County Economic Development Council is a private, non-profit economic development organization promoting smart growth in Chester County and the surrounding region for over 50 years. For more information, visit www.cceconomicdevelopment.com.